The standard (AMOS-5002-L) configuration is the slim rugged system measuring 250.2 mm (W) x 41 mm (H) x 123.5 mm (D). It comes with CFast storage socket and can withstand a wide temperature range of -20°c to 50°. The expanded (AMOS-5002-H) configuration is the rugged system with storage section that can support one 2.5" disk drive and two additional rear accesses for COM connectors. It measures 250.2 mm (W) x 58 mm (H) x 123.5 mm (D) and can withstand a wide temperature range of -20°c to 45°. Systems built using the VIA AMOS-5002 industrial system are completely fanless and their VIA Nano X2 E-Series or VIA Eden X2 processor can withstand a wide range temperature due to the creative de-thermal design utilizing blade style thermal fins. The VIA AMOS-5002 system design is capable of sustaining a g-force of up to 20 and 50 for AMOS-5002-H and AMOS-5002-L respectively, and easily assembled and maintained, using only four mechanical pieces to form a robust, fanless system with extensive I/O options. 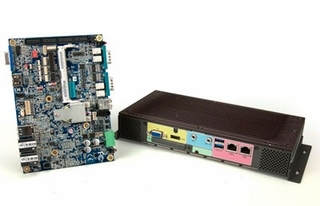 The VIA AMOS-5002 can be paired with VIA EITX-3002 Series board, which offers rich I/O and multimedia capabilities, making it ideal for a wide range of embedded segments including medical, healthcare, industrial and building automation, digital signage, kiosk, POI/POS, gaming and surveilLANce applications.